In honor of Princeton starting its baseball season tonight in Baton Rouge, here’s a photo of legendary Tigers coach Bill Clarke that I picked up in an auction earlier this year. Clarke worked with the team on and off from 1897 to 1901, when college teams often wouldn’t have full-time coaches but would invite professional players to work with the teams early in the season before reporting to their clubs. 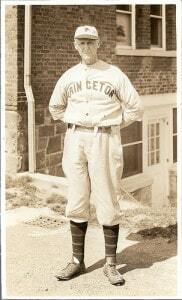 In 1909, Clarke became Princeton’s first full-time coach. One of the players under his charge during his long tenure was shortstop Moe Berg, a 1923 graduate who went on to catch in the Major Leagues and spy for the United States during World War II. Clarke stepped away from coaching from 1927-34, then resumed for another 10 years before retiring. When at home, the Tigers now play on Clarke Field.